The driver’s knee SRS airbag inflates in a moderate to severe frontal collision to help keep the driver in the proper position and to help maximize the benefit provided by the vehicles other safety features. SRS (Supplemental Restraint System) indicates that the airbag is designed to supplement seat belts, not replace them. Seat belts are the occupant’s primary restraint system. Do not attach accessories on or near the driver’s knee airbag. They can interfere with the proper operation of the airbag, or hurt someone if an airbag inflates. 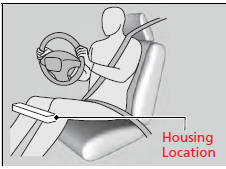 The driver’s knee airbag is housed under the steering column for the driver. The airbag is marked SRS AIRBAG. When the driver’s front airbag inflates, the driver’s knee airbag also inflates. 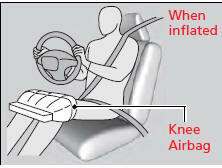 Even if the collision is not severe enough to deploy the front airbag, the knee airbag may inflate alone.